History | Thy Glory O' Nigeria..! A totally failed political system and the criminal-politicians in APC and PDP are currently responsible for the poverty and hopelessness in the country and they must be stopped in 2019 by allowing for fresh ideas and fresh minds in our political spaces. Otherwise we, or some other people, will be back in 2023 writing a similar sad story. ”Today, in my personal opinion, the dilemma that face Nigeria and the consequences of absolute misrule (before and) after the civil war are together probably the most tragic untold story of our time. Over the years, closer to 2 decades, l have written about Nigeria and the ills in the society. More pertinently, as each year wraps up, in the last decade, l continue to emphasise how Nigerians unabatedly waste the opportunities that each year provides or presents. The biggest opportunity in 2019 is the february presidential election. Historically, since 1966, Nigeria suffered a major setback in the world order. There were 2 senseless coups in 1966 that truncated an emerging democracy. The functional regional system of government that promoted developments across the different geo-political zones in Nigeria was discarded in favour of a useless and senseless unitary system. The hopes that came with the re-emergence of civilian rule in 1999 has faded into thin air as criminal-politicians in the major political parties especially APC and PDP have hijacked the country and continue to loot her resources, depleting wealth rather than creating and multiplying it. From 1999 to 2015, the period that l had earlier described as the ”worst years of our lives” as Nigerians, it was the PDP that held sway. A former military dictator, one Olusegun Obasanjo converted the 1999 to 2007 years to his personal rags to riches fable. He left the position of the president after he was forced out by a combined efforts of politicians and concerned citizens who were against his bid for a life-presidency. He had since denied the allegations despite the several billions of naira that evidently flew around in the National Assembly, where the lawmakers continue to milk the country dry to this day. It is an integral part of this tragedy that the people of Nigeria, both the enlightened and the unelightened, the educated and the uneducated at this moment cannot see beyond APC and PDP. It is one of the deepest cuts in the soul of humanity today. When Obasanjo left in 2007, he forced the way of his candidate to electoral victory. In what appeared like goodwill to a friend he had in the military, Obasanjo imposed Umaru Yar’Adua, the younger brother of Musa Yar Adua-his late friend in the army, on Nigerians. Umaru Yar Adua died due to a potracted illness allowing his deputy, Goodluck Jonathan to take over the mandate of power. Goodluck Jonathan later won the presidential election in 2011 and reigned over Nigeria until 2015. He served 6 years at the helm of affairs. Jonathan is a known drunkard and a very corrupt man from Bayelsa State. On several occasions, his wife had been found wanting on charges of corruption and money laundering. She never went to prison! Nigerians suffered under a deplorable economic situation even with Mrs. Iweala as the minister of finance. Mrs. Iweala later wrote a book condemning the powers that be in Nigeria who strangulated her efforts and so on. As a social critic l see the presence of Mrs. Iweala in Obasanjo and Jonathan’s cabinet as an endorsement of corruption and ineptitude. Mrs.Iweala did not blow any whistle and she did not resign to highlight the problems in the Nigerian government. During Obasanjo’s reign, she and her boss could not account for the returned Abacha’s loots. Mrs. Iweala in my humble opinion is one of the problems with Nigeria. If you cannot tell us the problems with Nigeria and the solutions while you serve and you cannot even call the police and the law on criminals serving with you, why bother when you are out of power and out of favour? Between 2014 and 2015 there was a mass cross-carpeting amongst Nigerian politicians. The senseless phenomenon was repeated in 2018. In 2014/15, many of the criminal-politicians in PDP joined and teamed up with other criminals in other political parties and established the APC. It was at this point that it became more obvious that Nigerian politicians have no ideologies and they are swift in repositioning themselves for the next, and every chapter of looting of the Nigerian treasury. Buhari is probably the first person in history (or just among the very few that may exist) that spoke evil of his country and downcast her citizens while claiming to be the ruler of the country. It was highly moronic! A notorious political godfather, one Bola Tinubu, championed the projection of a tyrant who had tried and unsuccessfully attemped the Nigerian presidency on 4 earlier occasions. Tinubu and another notorious politician called Rotimi Ameachi opened up the loots thay had accumulated from Lagos and Rivers state and ensured that the social media was well manipulated. It was the same way an ex-convict named Ibori was used by Olusegun Obasanjo to sponsor the election of Umaru Yar’Adua. The money meant for the development of the Niger Delta always wasted in many ways. True, Jonathan is a crook. True, Nigerians were suffering and Jonathan had no clue over the affairs of Nigeria. One woman, a very silly and corrupt person called Diezani Alison-Madueke, literarily took away Nigeria’s crude oil earnings and kept them as personal belongings. She was flying in jets with her children and family members and they were buying houses and merchandise around the world. Jonathan was either very weak or just a woman wrapper. It was a tragic regime. Sadly, the change slogan that APC sold to Nigerians in 2014 and which brought Muhammadu Buhari to power in 2015 had turn out to be the biggest fraud of the decade in Nigeria. The Buhari government is at par with the regime of Jonathan, if not worse. One of the most obvious corruption charges under the nose of Muhammadu Buhari-the grasscutter scandal-was never visited or sent for prosecution. Till today, the police have not made any arrest and the judiciary is working like zombies. So invariably, we got ourselves (what we thought was) a new government with old attitudes. When l wrote about the status quo after the emergence of the APC in 2015, many thought l was in a hurry. But l knew that the morning shows the day. Buhari is a puppet too in so many ways, serving the interests of Nigeria’s slave masters (popularly called cabal) and self. The old orders continue to reign. Almost all the criminals who have looted Nigeria since 1999 are free men and women. Murders and assassinations, latest of Alex Badeh, still have the approval of the presidency as they pretended nothing big happened. Mr. Buhari, contrary to the belief of gullible Nigerians, has no integrity. He should be arrested and tried for crimes dating back to the years before the Nigerian civil war. In Nigeria, the more things change, the more they stay the same. Those who reigned with Obasanjo and Obasanjo himself are enjoying their loots. Those who reigned with Yar adua are enjoying their loots. Jonathan and those who reigned with him are mostly enjoying their loots. One criminal called Dasuki who mismanaged funds with the approval of Goodluck Jonathan is not so lucky. He has been in prison since Buhari emerged and he had not been left out on bail even with court injunctions in his favour on the matter. In many cases and on many fronts, Buhari (whose identity is under probe by the IPOB) remains defiant and military-styled. In comparison to the other governments since 1999, this Buhari government is the most clueless. It is out of touch and the man (Buhari?) does not have the mental capacity to rule Nigeria. He is dull, lifeless (in the words of Trump) and lacks the intellectual abilities to lead a tribe, how much more a country. He remains a stooge, a clog in the wheel of progress of Nigeria since 1977 when he started looting oil revenues. Buhari cannot be absolve of the Abacha loots either as they were the crude oil revenues whilst he was the chairman of the PTF. Buhari is probably the first person in history (or just among the very few that may exist) that spoke evil of his country and downcast her citizens while claiming to be the ruler of the country. It was highly moronic! As the 2019 presdiential election approaches, both the APC and PDP are doing minimally in campaigns and reaching the people. They know that elections don’t matter as long as they can manipulate the electoral commission. That is where the real fight would take place as usual. The summary of the situation in Nigeria that l presented above is in my very own personal opinion probably one of the most tragic stories of the 21st century. After almost 60 years of bad governments, spread of poverty, spread of illiteracy (with 13 million children out of school) and a political arrangement that pitch one religion against another and one ethnic tribe against the rest, Nigerians have arguably lost their senses of political identity and several millions have no idea about the state of global affairs and where Nigeria is on the scale. A country without a stable electricity for example is probably 400 years behind the others. Nigerians are supposed to be living as royals. They deserve to be alright in all aspects of life. But sadly, and regrettably, only a handful of Nigerians are alright economically. But it is hard to even state that there is a Nigerian who is not living in poverty regardless of their wealth. Nigeria as a country is a depiction of poverty and penury. It oozes of hopelessness. To be sure, Nigerians are amongst the poorest people in the world despite the fact that the country is spread upon the richest combinations of mineral resources in the world. This is because a few greedy people are mismanaging the wealth of the country and they have refused to allow the wealth to grow. We are practising a senseless and useless unitary system of government since the 2 useless coups of 1966. We are allowing one person to steal 12 billion dollars and still be in public light contesting for political office or sponsoring candidates. One stupid question that l always have to try to address everytime l write an essay is: what then is the solution? I am tired of the question but still try to mention one or two hints. The shortest cut to recovery will be something very close to a (bloody) revolution where all the criminals holding the country to ransom can be arrested, surrounded and brought to very quick judicial judgements. This will change the course of history in Nigeria forever. However in the absence of the courage to unite because Nigerians have been divided in so many ways and along so many lines, choosing another path (other than the criminally-inclined APC and PDP) is presently the best option for Nigeria and Nigerians. It is an integral part of this tragedy that the people of Nigeria, both the enlightened and the unelightened, the educated and the uneducated at this moment cannot see beyond APC and PDP. It is one of the deepest cut in the soul of humanity today. The tragedy is far-fetched. In the face of the evidence provided, mostly by switching of political parties, that both APC and PDP politicians are part of a common criminal organisation, our people-Nigerians are still members of APC and PDP. I am in shock that people still attend APC/PDP rallies. It reminds me of why and how slavery in the hands of the Europeans and Arabs lasted more than 500 years. How can we be free if we (all) belong to criminal organisations like APC and PDP? How can slavery ever end in Nigeria if the majority are still inclined to the old ways or the ways of the APC and PDP? It is also a great shock to me as a writer that the memberships in APC and PDP are still massive. With the ways and manners that these parties have failed Nigeria, one would think that they should have faced dwindning membership and that the judiciary should be lining up criminal charges against all the key members and actors of these criminal organisations called APC and PDP. By now Nigerians ought to have pulled out and down the National Assembly which is also notorious for sharing the wealth of the country amongst its members. APC came with the change slogan and amongst the changes we expected were the implementation of the restucturing agenda on her manifesto and the drastic reduction in the salaries and allowances of politicians from the local to the state and national levels. None of that was done. We will never know what APC meant by restructuring which was the first point on its agenda. Buhari does not even want to hear the word restructure. He is that dull and insolent. In 4 years of the APC, we did not see the re-emergence of the public schools, we did not see committments to public health as the politicians continue to travel overseas for treatment. We can go on to analyse what could have been done in 4 years but the APC keep blaming the PDP for its non-performance whilst still allowing criminals to parade the national landscape. Nigerians should not make the mistake of committing the next 4 years (2019-2023) of the country’s fate into the hands of either the APC or the PDP. There are options. There are newer political parties that will perform better than APC and PDP. But the truth is that the problems facing Nigeria have gone beyond mere political parties. Still a new phase must emerge. The political system is wrong and senseless. Before the 2 useless coups of 1966, there was a structure that promoted healthy competitions among the major regions in Nigeria. It is something very similar to that structure that would be fundamental to the resuscitation of the economic survival of Nigeria. The current unitary system of government is baseless, useless and should only be promoted by people of low mentalities and nonetities-and that is where the APC and PDP politicians are. They are criminals and so they adopt and promote this useless system of government. Under the political structure similar to the what Nigeria had before the 2 useless coups of 1966, there would be no federal character and there will be no Abuja politics. We will all be busy promoting our regions educationally, healthwise, technologically and infrastruturally. This is what we must preach. We cannot go on with a failed system and expect development, unless we have no brains! Apparently, the essay is inexhaustible because there is no way l will be able to address the solutions in a single essay. The essay grew by the day since the summer of 2018 just the same way my anger grew as you can see from the tone/language of the essay. It is very intentional and meant to provoke. This is why l run this blog and for over a decade l have been shouting and still on it. I also run an instagram blog that updates daily. Check out @thygloryonigeria on instagram for my daily reactions to our problems. The most significant change that must happen soon is the taking over of government from APC and PDP politicians and making sure that they are prosecuted for all their crimes since 1999. Some politicians and military men have been around since the 60s or 70s. They should be taken care of by the laws of the land. They must face the music. Our problems are many. However, we must take the bulls by the horns. We will not develop even in the regions if we don’t elevate the rule of law above the rule of men. Apart from the Boko Haram war in the north east of Nigeria, there is yet no official declaration of war in Nigeria. This is why l consider the life we live in Nigeria as probably the worst hidden tragedy in the world today. Against the backdrop of the potentials in the regions and to see more than 100 million people living from hand to mouth, unsure of the next meal: l see no greater tragedy today in the world outside a war zone. The African Woman On Social Media: Where Is Your Dignity? In a recent article, l wrote about how the Nigerian women in Nollywood have misrepresented the African woman. This article is a follow up to it. The African Woman On Social Media, Where Is Your Dignity? In a recent article, l wrote about how the Nigerian women in Nollywood have misrepresented the African woman. (https://adeola.blog/2018/02/24/nollywood-is-failing-africa-in-the-appearances-of-african-women/).This article is a follow up to it. It is now generally accepted that for the African woman to be accepted as pretty or beautiful, she needs to be wearing a foreign hair popularly called wigs. The wigs come in various colours, sizes, forms and dimensions. As I previously pointed out, the industry provides jobs for several women and is a multibillion-dollar industry in Africa and globally. The target is simple. It is the African woman who has lost her pride and sense of dignity. The present generation of African women dominating the social media, film industry and other social platforms have lost it completely. They are rich, they are famous and they are celebrities. But they lack one thing: self-dignity. Again, l will go back memory lane. I am 46 years old and I remember growing up in Lagos, South-West Nigeria. My mother never liked the idea of my sisters putting chemicals on their hair and she frowned at it. Her take was that my sisters must always braid their hair the African way. It was the same for many families. Our parents did all they could to persuade our sisters and even some of us guys from using chemicals on our hair. The barber shop it was for us. But just a couple of years down the lane. The dignity of the African woman has been completely eroded. She takes no pride in the colour of her skin. She takes no pride in the texture of her hair. She takes no pride in her curly, tangled hair. The African woman wants straight hair. It is so bad that so many African girls and ladies would not appear in public without the foreign hair. It is going to be one of those huge tasks that we have ahead of us in Africa to reverse and revert the trend. But it is a cause some of us must continue to remind ourselves of. The celebrities and stars on Nigerian and African screens have failed Nigeria and Africa. They are big stars and they are the biggest hope of a trend reverse. A few of our stars are featured here. There are several more. But we just need all of them to take up the cause and help us reverse the trend. They may also need help themselves because they will not be able to do something about it if they don’t realise that they too have lost their sense of dignity and African-ness. But with several million followers on Instagram and twitter, the best way to bring back the pride of the African woman is through these social celebrities and actresses. Some may argue that they use the wigs for acting and work, but that argument does not hold water. What is wrong with acting and working with the African hair? Why must we act, work, live and go around with foreign hair? Why are we not proud of who we are and what nature endowed us with? We need Africans to promote Africa. We need ourselves to sustain and maintain our values, culture and way of life. We have lost our languages. We have lost our mode of dressings. We cannot afford to lose our heads and our brains with the hairs. Something urgent need to be done. In our schools, from the primary to the university, awareness need to be created about the pride of the African woman. One day l wrote to @iamlizzyjay about her natural hair and l implored her to keep it African. But l see how hard it is to remain pure and natural in the industry because she wore wigs a few times and went back to natural a few times. @calabarchic does not even know where to stay. She is also back and forth. She’s trying to keep her natural hair but the industry and the “norm” for what a woman in Nigeria should look like is creating a lot of confusion. It is like if you are not wearing wig or a foreign hair, you are local. That is how terrible the image and dignity of the African woman had been battered. You have to feel sorry for the African woman especially from the entertainment industry point of view. They need help. We need help because their takes have destroyed our values and expectations of the women that nature gave us. We need a return to the basics. We need role models of African origins to keep African culture and tradition. I look forward to the day that African women will look 100% African again. 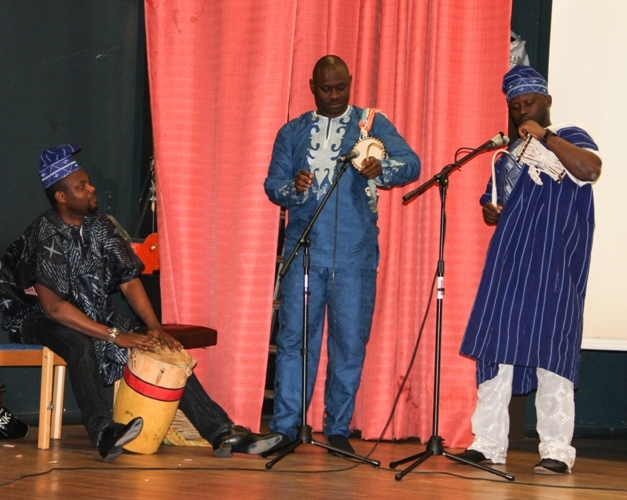 The Yoruba Union in Stockholm, Sweden successfully hosted its third annual Yoruba Day celebration. 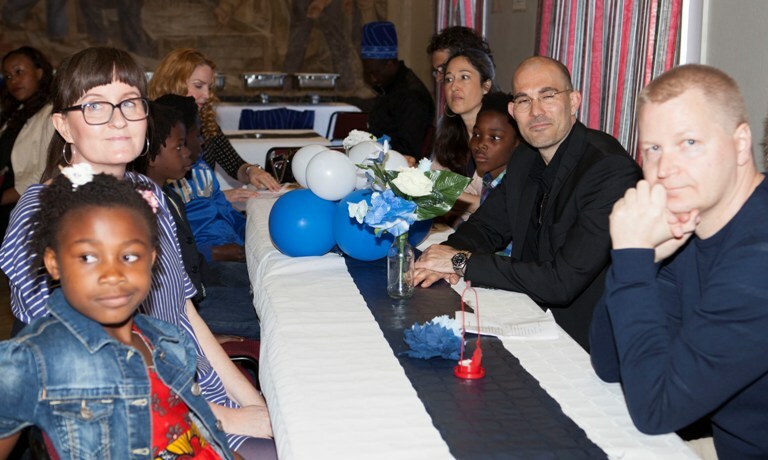 The event took place on Saturday the 23rd of May 2015. 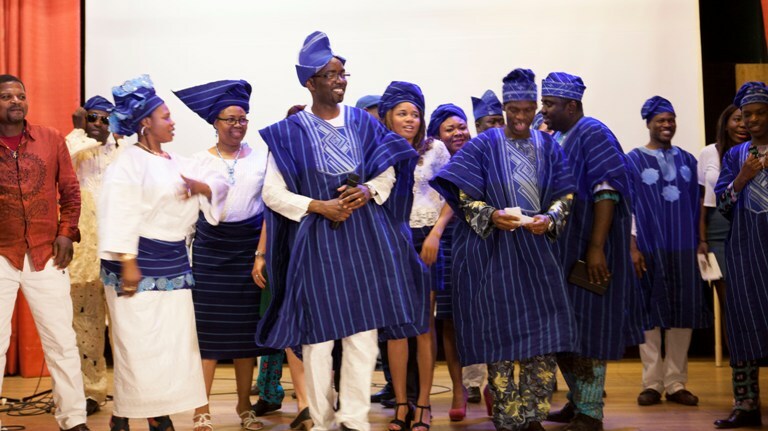 The Yoruba Day in Stockholm is a day set aside to celebrate Yoruba culture and heritage in Stockholm the capital of Sweden. 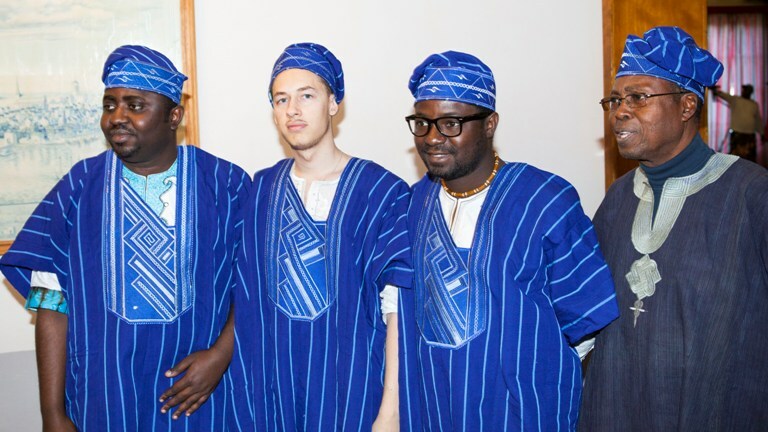 The president of the Union Adeola Aderounmu in his welcome address trace the history of the Yoruba Union in Stockholm to 2010 when a group of young people came together to form the association. The Yoruba Union was registered in Sweden in the same year-2010. 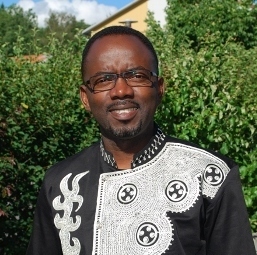 Yoruba Union in Stockholm is a non-political and a non-profit making organisation. This uniqueness distinguishes the Union from other associations that have been formed for the purpose of making profits or for self-aggrandisement. Mr. Aderounmu stated that the Yoruba Union provides a social platform for the Yoruba community in Stockholm and even in Sweden as a whole. The union provides a genuine base where members feel a sense of belonging and togetherness that have continue to contribute to the growth and development of the union. 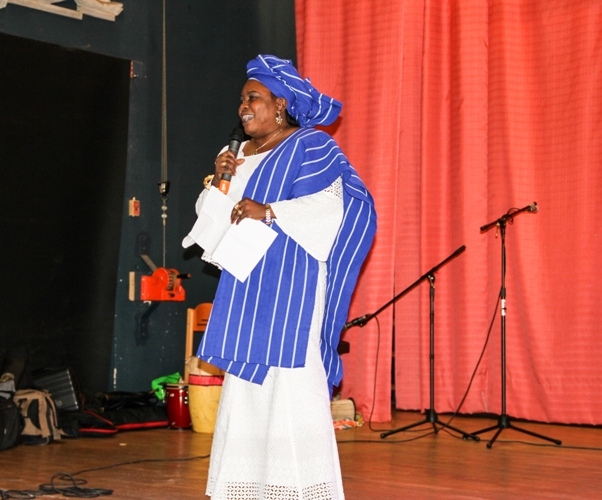 Under the platform of the Yoruba Union in Stockholm the Yoruba culture and tradition is being spread and made known in Sweden. 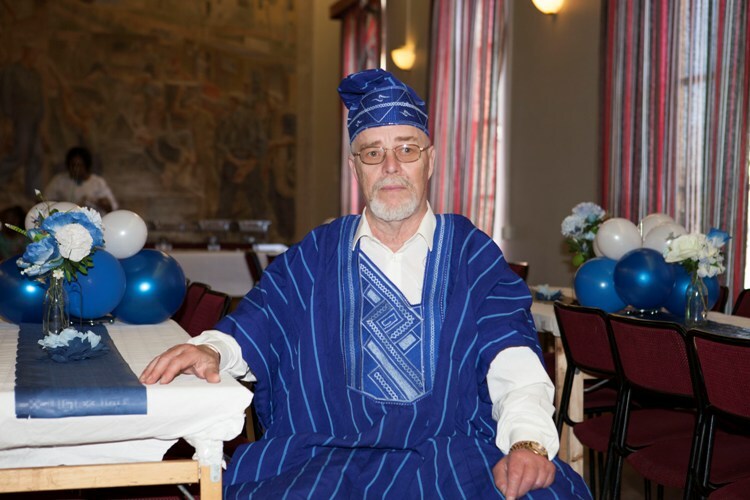 The Yoruba Union-Stockholm is now very popular in Sweden. In April 2015 Adeola Aderounmu represented the Union in a national televised live program. The Swedish celebrity TV-presenter Doreen Månsson, who spent some part of her early life in Ibadan-Nigeria requested the presence of the Adeola during a program that was dedicated to Nigeria. 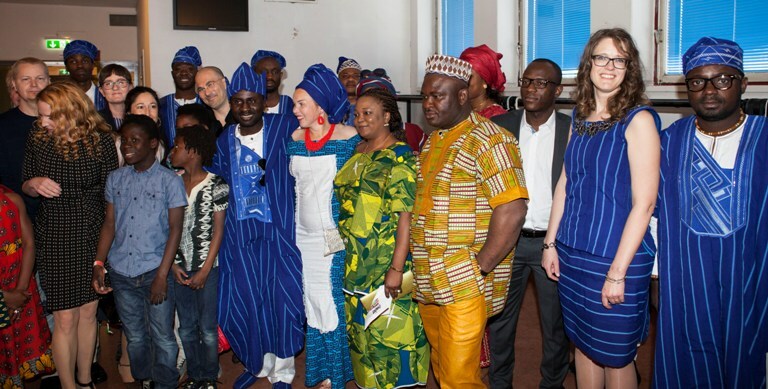 In recent years the Yoruba Union in Stockholm has also worked together with the Modern Museum in Stockholm during the display of ancient art work from Ile-Ife at the museum which spans a period of about 6 months between 2013 and 2014. 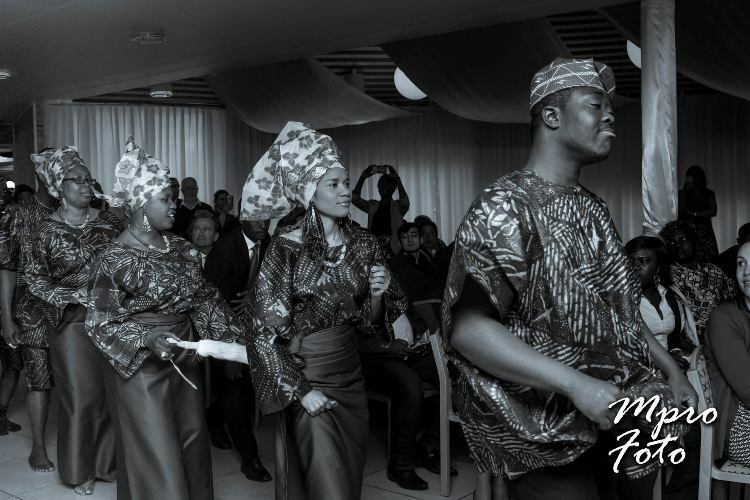 The Union continues to receive request to represent and show the Yoruba culture in various ways and forms. The Yoruba Union has given lectures /talks bordering on the Yoruba Ifa religion and ancient art work from Ile-Ife. 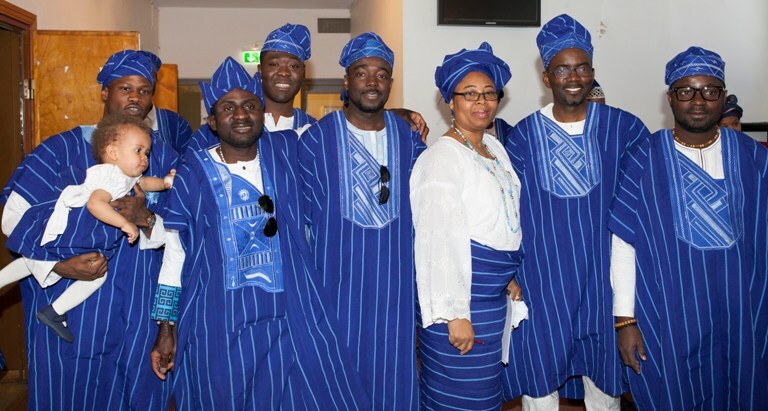 Five days after the celebration of the Yoruba Day in Stockholm, the Union represented West Africa at this years Africa Day celebration in Sweden. 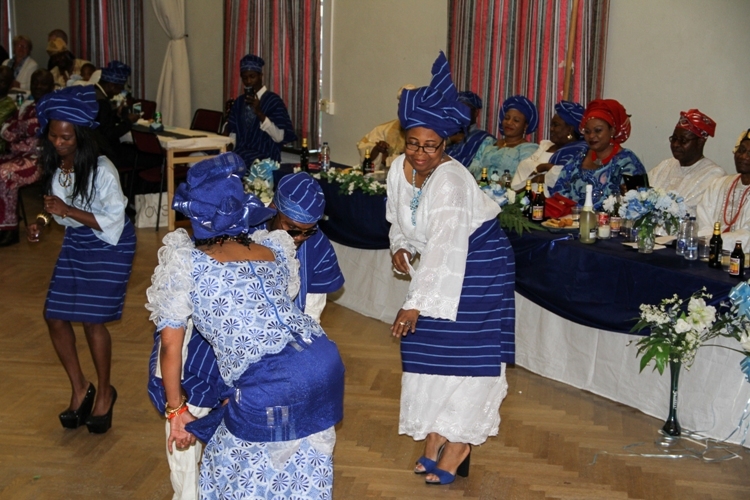 Yoruba dance and songs were presented to the rest of Africa. Yoruba Union is growing from strength to strength. Over the past 5 years the Yoruba Union in Stockholm has put YORUBA culture permanently on the cultural map of Sweden. 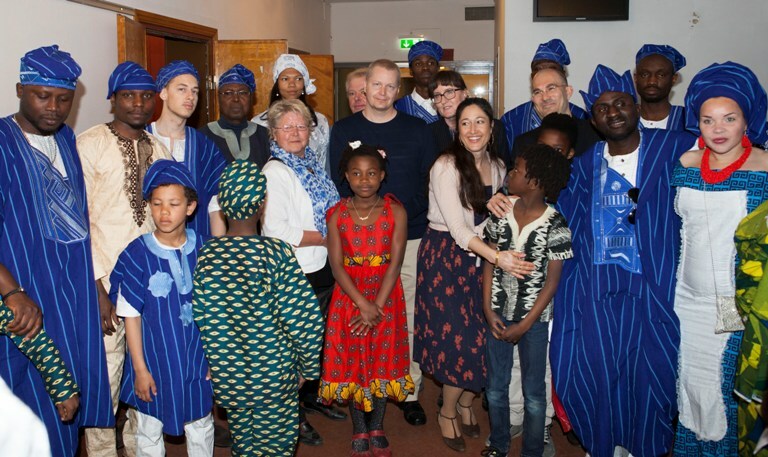 This year the city of Stockholm Council through the department of culture gave some financial support to the Yoruba Union. This sort of partnership will ensure more progress for the union in the forth coming years. 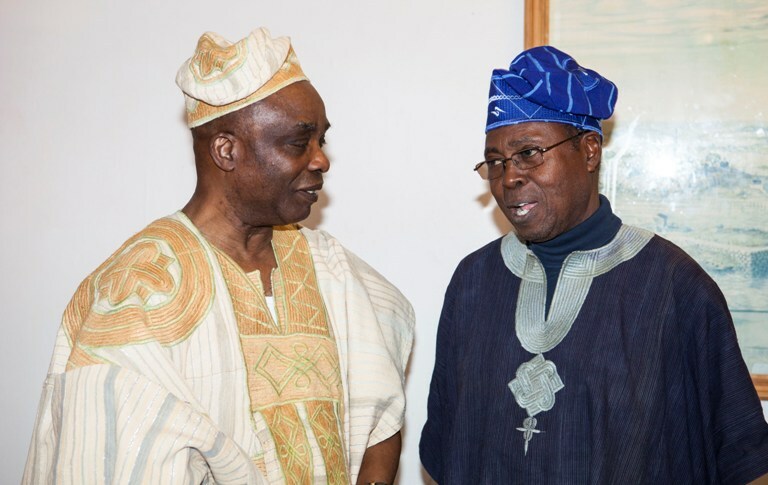 The Yoruba Union has a close working relationship with the Nigerian Embassy in Stockholm. The Union is also a prominent partner with the educational institution-SENSUS, based in Stockholm and Gotland. Mr. Aderounmu emphasized the positive roles played by the executive and the entire members of the Yoruba Union in Stockholm towards the sustenance of the ideals of the union and the continuous progress that the union continues to make. He acknowledge their positive energies, innovations, determination and collection of life experiences that have been brought into play to mastermind the success of the annual Yoruba Day and other activities of the union round the year. In her address the Head of Mission, Nigerian Embassy Sweden Mrs. Jane Ndem said that the Nigeria embassy in this era of citizen diplomacy strongly supported all Diaspora organisations and ethnic unions as their roles both abroad and back home cannot be overstated. She urged Nigerians to remain law abiding citizens and should feel free to contact the embassy whenever the need arises. Mrs. Ndem commended the efforts and enthusiasm of the Yoruba Union in ensuring that the Yoruba culture is projected effectively to African and the rest of the world through the formation of the cultural group. 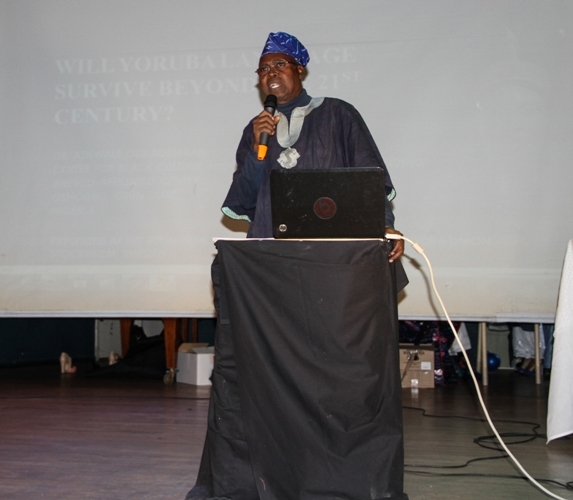 The title of the lecture was: Will The Yoruba Language Survive Beyond The 21st Century? Dr. Adeniran emphasized the importance of speaking Nigerian indigenous languages to children at home especially before the age of 11 when the ability to learn languages begins to deteriorate as the brain begins to change physiologically. He also lamented the lack of implementation of policy on the preservation of Nigerian indigenous languages. He emphasised the importance of making use of Nigerian indigenous languages as the language of instructions in early age schools and up to the tertiary levels. Dr. Olu Adeniran deplored the elevation of the colonial language (the English language) above the other Nigerian languages. Making students textbooks available in our indigenous languages will also be a way to revive and preserve Nigerian languages so that they do not go into extinction. 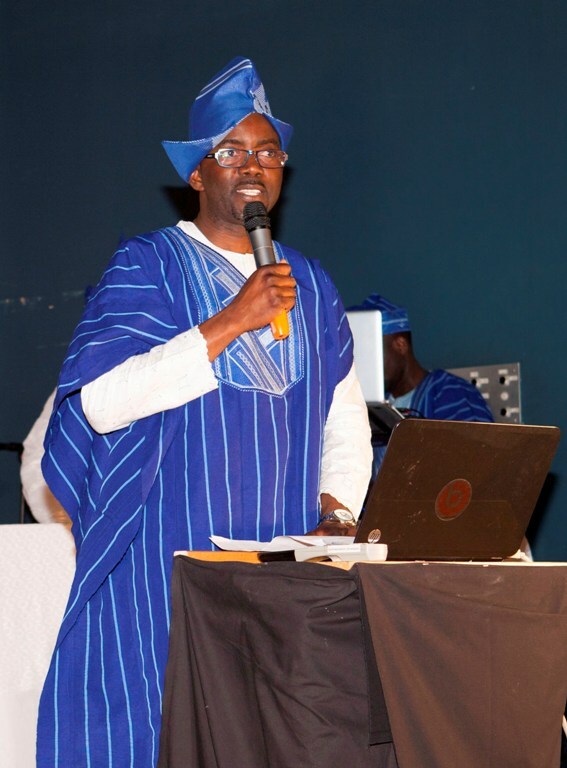 While encouraging Nigerians in Diaspora to ensure that they make it a point of duty to ensure that they preserve their languages by speaking them to their children, he pointed out how Nigerian literary giants first mastered their indigenous languages before they became global names in the literary world. He gave the example of professor Wole Soyinka who won the nobel prize in Literature in 1986. 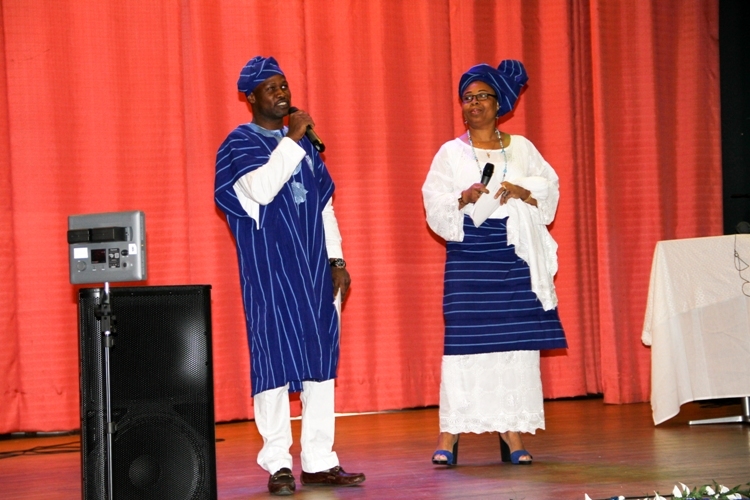 During the celebration of the 2015 Yoruba Day, there were songs and dances in accordance to the Yoruba tradition and culture. 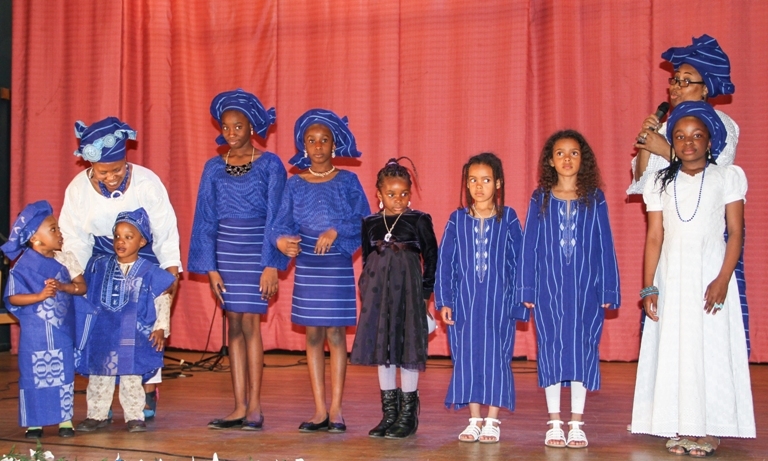 There was fashion parade during which some of the popular Yoruba traditional attires and modern designs were on display. 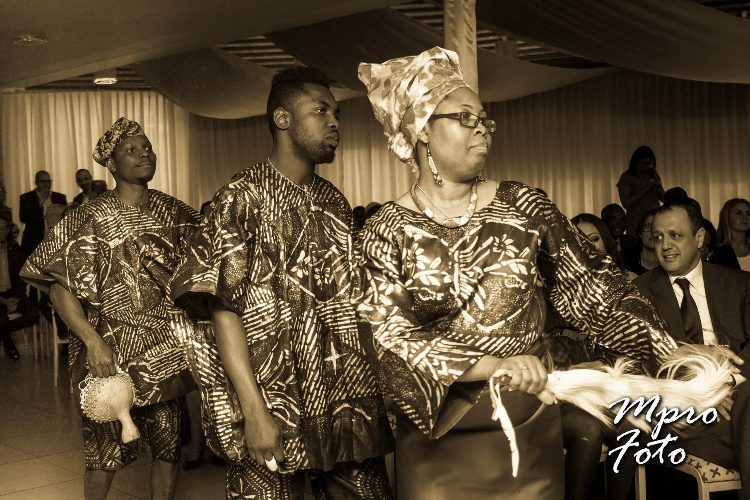 Fashion parade of Yoruba attires. 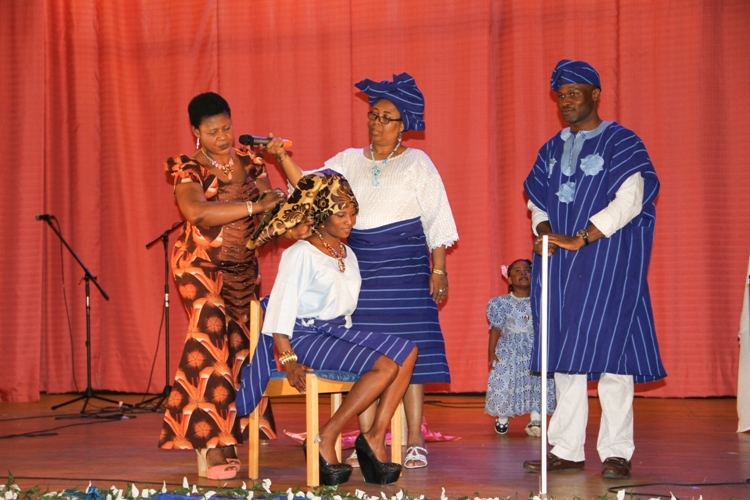 There was also a session demonstrating how Yoruba women make and wear their headgears popularly called gele. 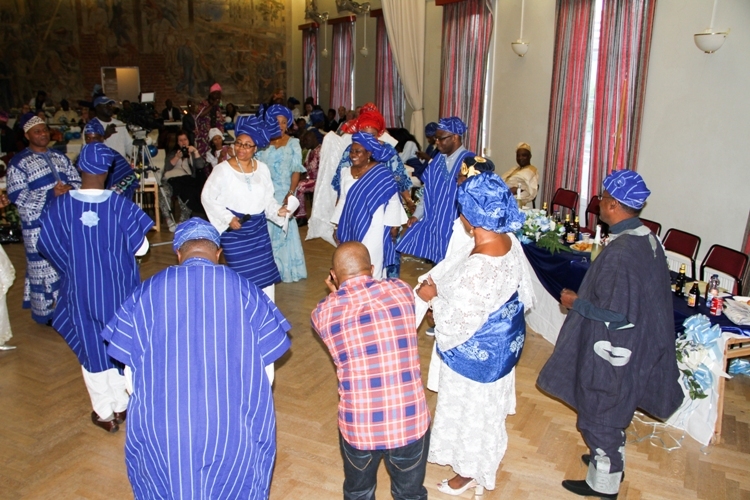 Guests, friends and members of the union danced to popular Yoruba music. They were also treated to exclusively Yoruba dishes. Dr. Adeniran and Dele Momodu (in absentia) both received the Yoruba Union Lifetime Membership Award. 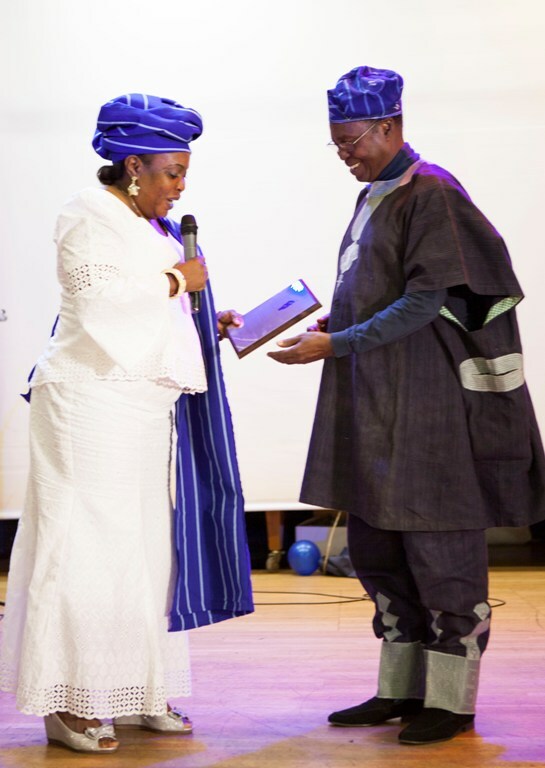 They were also recognised for their contributions to the development of the Yoruba culture and Nigeria in general. The event was drawn to a close by a vote of thanks given by Debo Faseyi and Ibrahim Onifade. They thanked all the special guests and sponsors of this year’s event. They even extended the greetings sent by Dele Momodu who had made plans to be at the event but had to return to Nigeria from London 2 days before the Yoruba Day. Mrs. Victoria Majekodunmi, Engineer Olatunde Aluko, Princess Adetoun Lasebikan, Mr. Salimonu Kadiri, Ify Onuoha, Gloria Viegurs and Mr. Tayo Adeyemi-the editor of African News, Sweden. 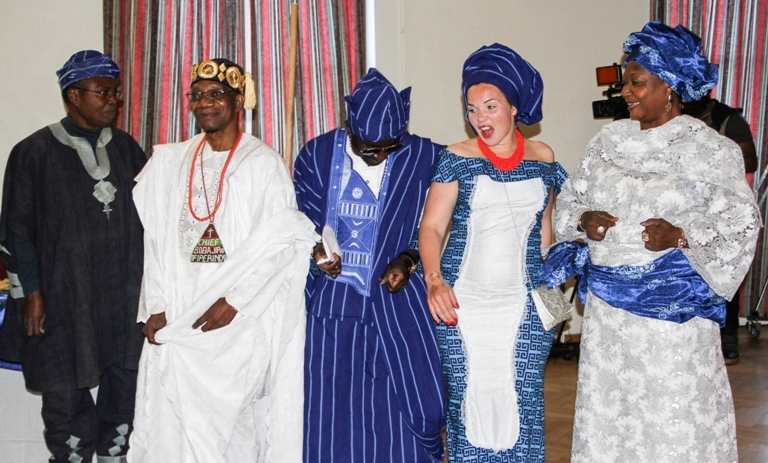 The full official album of the Yoruba Day 2015 will be available on our website and Facebook group. No part of this story or images may be reproduced without prior authorization. All is not well in this place, this land. The people have diverse and confusing opinions about the true meaning of life, so it was difficult to find the solutions to their problems. When Bawa was born and raised, no one provided him with the education he needed. He is from the north part of the land. His parents told him it was enough to obey. Everyday he prayed but he didn’t know if his prayers hit the roof or if they went above the clouds. His family did small retailing and didn’t have to depend on food tickets from the local councils like several urchins in the north did. 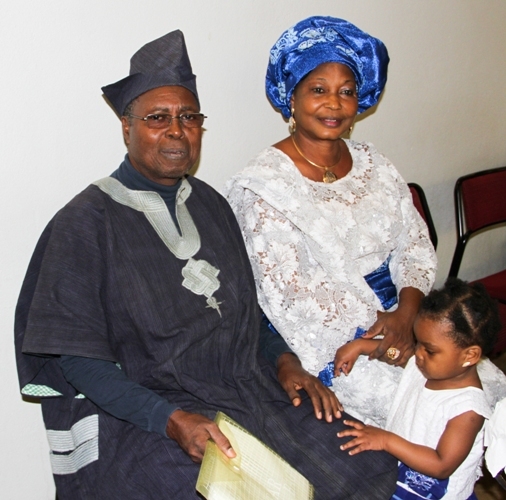 When the expanding family business brought him to Ebute Metta, his life changed. He became rebellious and started asking questions every time he went back to the north. He found a perfect companionship with some co-travelers and a few men who have been away also, even further north. One day he looked at the extent of ignorance in his village and felt extreme bitterness in his heart. Someone told him that men are not supposed to cry but he knew that until that moment, he had lived the life he didn’t choose. The colonial thugs who invaded the land several years ago told the foolish kings in the north never to educate their wards. Stupidly, there was an agreement to the insane treaty. How can anyone think they could be kings or rulers for life? Without the royal blood, no one is born to rule. Even royal bloods do fade. How can anyone even think that knowledge is the reason for the crises in the Mediterranean? Knowledge is power, not war. It’s true; humans always blame objects and abstract concepts for their foolishness. Sometimes they say they are looking for a scapegoat, as if one was lost. They always find the reasons to go to war. An old man from the east once said to the people, “10 kings own 10 eras”. He said those who forget their history can never be free. He also said “if you fight a war, make sure it is for your freedom”. He added that “peace comes from freedom and absence of injustice”. But the people are reading less and not showing understanding for the wisdom hidden in books. The stupid king in the north, just like all the dead kings before him, has also not fulfilled his promises to the people. Like many other places in the land, many people don’t have water, electricity and shelters to cover them. It is worse here in the north. The king and his emissaries have acquired what should have been shared equally among the people. When Bawa and his gang members started having their secret meetings, they got the people’s ears. Walls have ears too. They soon sold their souls to the elites, they lost their plots. Hopelessness can ruin a man’s conscience. At this point the people have started wondering if cannibalism will be a criminal offence if that becomes an option soon. Evil grew in their hearts due to deprivations. This king in the north has no plan. He’s quick to blame the woes in the north on the reign of the king in Abuja. If we had one of us as the king in Abuja, our ancestors will be kind to us and our lives will be better he often said. But the king in Abuja is really upset. He lacks charisma and hardly spoke but one day he said “ask the king in the north what he has been doing with all the tax returns given to the north and all the pure gold that he receives on behalf of the north four times a year”. Sometimes no one knows what to believe because the king in Abuja usually soaks himself in the pleasures of alcohol and women. One day when the people came from everywhere to plead with him, he chased them away with whips and bullets. Then another time when the people found the courage to return, he repented and told them to go home and pray. Sometimes when he doesn’t know what to think or what to say, he simply said he didn’t care. When the people refused to pray he commanded one of his brothers to do so on behalf of the people. His brother dressed up like a knight and prayed the prayer of a fool. The people thought he was insane but he didn’t care one bit. He knew his brother-the king- was too drunk to reason. But he got a lot of gold for his worthless prayers. Now, frustration is growing in the land and the people do not know where to turn or who to speak to. They can never trust the soldiers. They are men of fortunes and when they had tried or pretended to help they did things worse than the kings could ever have done. They abuse drugs and they denied being homosexuals even when it was not yet a crime in the land. Now it is a crime. But the soldiers laughed because they know that it is easier to practice homosexuality in prisons. They also knew that going to prisons will not affect their sexual disorders even if the lawmakers still think it is an abomination. Their biggest laughter on this matter came last, because they know that they live in a lawless land. They will never go to jail. In the barracks, they wonder who really is mad. Someone said it’s the trait of the kings. One soldier who all of his life, had neither tasted tobacco nor alcohol shouted “we are all mad”! When they asked him the reason for his thoughts, he said, because when we sleep at night, we all lie in the same direction. Then they laughed again because they did not understand his reasoning. He is a soldier from Ebute Metta. He went to bed, worried. How did I end up with these fools, these mad men? In Abuja, the king had slept several times with one eye open and the other closed. He too is convinced that soldiers are treacherous and mad. Sometimes he had unpleasant nightmares. He’s encountering many strange dreams because his heart is not pure. One day he dreamt that the dissidents had captured him and cut his throat. Then he vowed never to see the eyeballs of the soldiers from the north. He will never meet with the king of the north again as well. The king of Abuja rebuilt his network and brought foreigners to protect him. He decided that he would have 99 vehicles when he is travelling on the road. Among the people, he gave gold and silver to the greedy councilors. He called them his loyalists; they will always speak for him in such a way as to create false hope while his reign of injustice persists everywhere in the land. It was easy to find religious people as members of his loyal groups. When the unrest started in the north it was some of the councilors who gave the rebels tools and the courage to unleash violence. They used some of the monies they stole from the land when they were kings in Abuja and started various propaganda aimed at killing the present king. Bawa and his friends got along with the treachery when the elites approached them. He started to visit Ebute Metta less frequently. At some point he left the holy books and started to listen to his heart. In their group, as dissidents, they got very rich at the expense of the people in the north. His heart told him that he’s now one of the reasons people remain poor in the north. At a recent meeting Bawa and his group members decided to abandon everything that they believed or were taught. They will make their own rules, now that they have wealth and weapons. There had been a long call by some fools to return the kingship in Abuja to the men from the north. The stupid idea of born to rule has erased the ability of the north to think freely. Some of their kinsmen are happy to dine and wine with the king anyway. Many of them knew that feudalism is a form of injustice but they want to find a bigger fault with the king in Abuja. The poor people are angry, infuriated and helpless. There is confusion everywhere. There is something the people are not doing. There are things the kings and the elites are doing maliciously. So across the land, all is not well. One girl from the west brought a message of fire on the mountain to the land. The people lacked the wisdom to discern her message. They doubt that the gods spoke through women. So the girl went to another land. Then she prospered. One man sang for the freedom of all the regions but they put him in prison and poisoned him. He died. Every time someone stood up genuinely for the people, the people watch from afar, disunited. Then the freedom fighter is killed by an angry person or someone sent by any of the kings. The land is flowing with the blood of innocent people. Even the gods shook their heads because the people did not understand the signs and processes of freedom. Bawa and his generation grew up in ignorance. At that time they were easy preys for wrong political purposes. Bawa’s exposure led him to some light, but it was half-light. For vision, half-light is more dangerous than total darkness. But those who don’t know that, what is worth doing at all is worth doing well always argue when taught this principle. Bawa doesn’t care anymore about the consequences of disobedience. His views about life are now at conflict with one another. Now he, along with the others in the rebel groups, is at war with the society. They will bring down the reigns of the king in the north and the king in Abuja. He doesn’t know what his actual plans are in this senseless war. He and his evil gang members have abandoned their foreign teachings. They have now turned to the evil in their hearts. They are now monsters and their unknown ambitions surprised the north, totally. There is trouble in the north. There is pandemonium in the east and the west is choking even with diseases due to congestion and migration. The south is polluted, full of treacherous men and unsafe for existence. Mama Esan is trapped, Chinedu is depressed and Bawa is ready to die for the things he does not believe in, the things he does not even understand anymore. At the town hall meeting, Mama Esan wept, again. No one could console her. She even refused to be consoled because she needs to set her soul free from the suffering of her flesh. She asked why the kings everywhere have so much wealth, women and property when the people are suffering. How can her dreams come true? Why did things go so wrong? The more questions she asked in her heart, the more sorrowful she felt. Chinedu in his depressed mood fell asleep before the meeting ended. In his dream, he saw what life was supposed to be and he woke up with a thunderous cry. The hall was empty when he opened his eyes. Bawa was not at this meeting. He will never come back to Ebute Metta. He had decided to remain incognito until vengeance is achieved. He thought the kings are all wicked or mad as people say. But he also hated those who made him cry. Indeed, he cried when he knew it was normal for men to cry too. People need to set their souls free from the sufferings of their bodies. Tears are the medicine of nature and they cure men from suicide. He thought his life is upside down and not worth living. He doesn’t know where this will lead him or where he wants to go from here. Sometimes the king in Abuja speaks after the town hall meetings to get feedback and make new reforms. When the king spoke after the latest meeting held in Ebute Metta, he was far from reality. This was worse than what the people had thought. So now everyone across the land knew the gods have made him deaf. They know what will happen next because that is a premonition that is easy to interpret. This gives an unusual hope that change will come soon. Sometimes people think that time is their enemy. But time is a good concept. It carries out everything at its appointed moment. Because humans have faint memory, they forget their destinies. Therefore their actions can be in contrast to their desires in life. If you want freedom, you must act correctly or appropriately. Time will bring all things to pass at the appointed moments only if the actions that preceded those moments are just and upright. In this entire clamor for change, the south remains indifferent because the people inhabiting the place have become like the proverbial soap and leaves. They are used to their sufferings and living poorly in the midst of plenty. In fact they are like the thirsty fish because their land and water lie in ruins. The king of Abuja was once one of them. Bawa the boy from the north does not believe in the gods. He does not know what the people in the east or west have on their minds but what he wished is what the people said the gods have in plan: that when the time for freedom comes, there will be no going back, that all the kings are mad and that their kingdoms, big or small, will pass away. Hope is quenched when we die. Maybe tomorrow will be better, Mama Esan thought out loudly pondering what she was going to do next as she stood on her feet. She is awake now. Still a voice echoed in her head: what if it is true that tomorrow never comes. Then she sat down again, and wept. Mama Esan ran out of the house. The rain was heavy. She quickly cleared her stall and salvage the remaining items she could grab. Earlier that day she had hoped that things would get better and that her dreams would come true. The heavy rain destroyed almost everything including her temporary stall, her wares and then some parts of the house itself. The roof is always the first part you can imagine. Her husband has been jobless for 7 years. The dwindling economic fortunes and the total collapse of infrastructure especially the absence of power supply led many companies to shut done their operations. Some of them declared bankruptcy just as a way of getting out of the unrealistic economic environment. If I want food, it doesn’t mean I have to be able to manufacture a gas cooker or an electric heater, one of the affected CEOs declared, proverbially. Then he went to another land. All of Mama Esan’s children have been withdrawn from their different schools. No one had expected that the cost of education will be so high. No one thought a time would come when there will be no food on the table. But like a pestilence the day came. In mama Esan’s existence, hope no longer seems to have a place. For her, only vengeance was sure if she could have one. Mama Esan knew though that her situation was not an isolated one. Many people suffer similar fate as she does. Life no longer presented them with choices. For some people the dictionary can as well be rewritten and the non-applicable words deleted. There is a man called Chinedu. The first time mama Esan saw her was around 1985. He was just a boy. At that time he enjoyed a lot of facilities. But all of those (fading) facilities and infrastructure soon disappeared completely. The best thing in his life was that he got the education he wanted. This was not possible in every part of the land. When he left high school in 1990 Chinedu decided to try his hands on business and he started as a learner. He learnt the buying and selling trade and gained his freedom when he became an expert. Then he was able to rent an apartment though he was a bachelor at that time. He had his eyes on the future. However since 1993 no one knew or understood what went wrong. Perhaps people just denied the knowledge of what went wrong with their lives. Some people said the gods got angrier, and others said their ancestors are now restless. Some people read the new foreign holy books and thought they found new hopes. If anyone had told Chinedu that he was going to be living from hand to mouth in 2014 he would have sworn to Amadiora, one of the gods he knew before 1985, that that day will never come. He would have called the Alusi, if he knew how, to strike the speaker of the strange words. 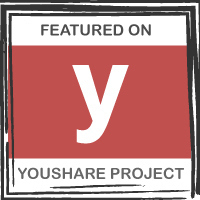 Now married with children, Chinedu can no longer afford the cost of running his business. It’s too hard now to tend a family. He is terrified everyday and he had seen some people landed in prisons after attempting to push hard drugs as a way to keep their businesses going. The law is not effective but it always catches up with the people who need protection the most, if they erred. One of his friends died with foam puffing from his mouth. The wraps of cocaine inside of him exploded before he could deliver them. The power generating plants kept breaking down and the cost of petrol for home and business became unbearable. Chinedu gave up. One day he survived an unexpected explosion. The generator was bad but he didn’t know about it. Now, he’s not sure if he should move back to his village with his family. He can go back to his grandfather’s farmland. He is afraid he may be called a failure. His mind kept roaming, as he ponders on the alternative “businesses” of armed robbery and kidnapping. By resisting the temptations, he thought he had rebuked the devil. Some people think that the devil exists and that he is male. People think the devil should be blamed for all the negative things in life. When he was a student, Chinedu learnt about the culture and mythology of the people in Ebute Meta. He was held spellbound when he learnt that the devil was not Esu. He knows now that it was the invaders who taught about the devil. Among all the tribes in the land, the people of Ebute Meta, Amuwo and Araromi have no version of the devil in their existence and traditional institutions. It was also the foreigners who invented the term religion and misapplied it. Ignorance ruined the minds of men and they thought that the white man’s devil is the Esu in Ifa’s mythology. Ifa is not a religion; it is a way of life and the explanation for everything associated with mankind. It was about time the human race laid the blame for global ruins at own doorsteps. Man is responsible for the evil deeds in the world, not an imaginary demon. Man created religion and a place in his own heart called “devil”. Ifa is not human but it can admittedly be either good or bad depending on the man that applies it. When people find evil in (d)evil, maybe they will be convinced that both terms are the inventions of ordinary mortals. Many people in Ebute Meta are happy for the knowledge that came their way through basic education. But they are now sad because of their misfortunes. What they have learnt have seen them through many life changing experiences. Their hope is that the prevailing problems they encounter will pass away. But what are they doing about these new problems? There was a man who left Ebute Meta. He went to a very far place in the land called Abuja. He was in search of fulfilment and his name was Muyiwa. He was killed in a bomb explosion. The bomb was set off by the dissidents in Abuja. No one can see the future unless the gods smile down on them and when risks are not taken sometimes, it’s hard to tell what the outcomes could be. After more than 10 years as a jobless engineer in Ebute Meta, this young man was exterminated. He was just 37, which is 3 years shy of age when they say life begins. Muyiwa was a brilliant man and he was originally from the village of Eniyansoro. He had been told of a job opportunity in the far place. He thought he’d try out his luck. The debt he owed to get to this place of death will never be paid back. The dissidents from the North have now come to Abuja. People say they are also mad because they do not believe in visions but accepted the foreign teaching that they will be alive as martyrs in an unknown place by killing innocent people in suicide missions. The king of Abuja is foolish. He believes in the devil so he did nothing about this evil when it showed its ugly head. All his life, all he-the king-wanted is power and he chose to dine with the “devil” because he had a choice. He had learnt from his youth that he could dine with the devil by using a very long spoon. Many of the previous Kings of Abuja are known to have suddenly perished. Some people say the gods must be crazy in this land because they first make the kings deaf and then they destroyed them. But the gods are not crazy. They are probably amused. Even so because the various kings in the different parts of the land are hypocrites who pretend about the new religions while possessing deep seated intuitions about the gods and they always thought that sacrifices are better than obedience. So they-the kings-make many ceremonies and they give away many unsuspecting fools as living sacrifices. The biggest human sacrifices have always been in Abuja and towards the North of the land. Money and gold can make people to stop thinking, so they don’t see the evil that other men have planted in their ways. Another selected delegate to the king’s ceremony died 2 days ago and still people want to blame the devil. If the king can kill one of his brothers, who can be free from his thirst for power? When people are hungry, they also sometimes unknowingly sell their souls. They have no food because many of them left for the cities. They thought they will get rich in the cities. Now with fewer jobs, many of them have no money as well. So the people also said that money is the root of all their problems. How can the people know that the devil is not a demon and that he does not exist? Men clothe their hearts as devils and propagate evil despite the knowledge of the truth with which they were born. Mama Esan thought about the religiosity of all the kings that she knew: in Ebute Meta, in Abuja and even in the North. Then she wondered who God is and his relationship to Olodumare. This was the first time in her life that she gained awareness of her own thinking about religion. The present king of Abuja took religion to an absurd horizon. No king before him adopted religion as widely and open as he does today. Yet, it is now that the greatest devastations beseech the land. Mama Esan became really confused. She was not finished with her thoughts. She knows a lot about many of the books her children read when they returned from school. The stories are mostly sad stories. In history, in geography and even in science books, she listened when her children study about many diseases and how some of them are incurable. She’ll be sad if there are no ways for the children to return to school. We are in a hopeless situation, she said to herself. Then she thought that she had a voice in her head “We become religious because we are afraid of death. Yet we die and become dust”. She woke up drowned in her sweat. She thought about Muyiwa. Ebute Meta is not a big place. Bad news travel fast. She knew about the travails of Muyiwa and many young people in Ebute Meta. She remembered the day Muyiwa and his friends came to her and ask for some items on credit. She overheard him when he told his friends about a foreign film called Fried Green Tomatoes that he had seen and that his favourite line in the movie set in the 1920s was: no one would leave this earth alive. One day, in order to start a discussion, mama Esan asked her neighbour: what is the meaning of premonition? One of her children had said that he thought Muyiwa had a premonition he was going to die in a far (foreign) place and that was why he talked about the foreign drama and death. All that is foreign cannot be evil. The power of discernment is one of the greatest gifts the gods left to the people when they departed from Araromi. Muyiwa was philosophical while his travails lasted. He spoke of the several millions like him and wondered from where their hope cometh. He died along with several other innocent people. His hope never materialised and his body parts were shattered. Life can be cruel even to the kind. The evil in the hearts of men and kings does not discern because they think it is the devil’s work. With all sorts of religions, vices and crimes are committed in the land. The taste of foreign religions left the people in this land in the rhythm of the shadows of mental slavery. It became more devastating because somehow they were not able to differentiate between rites and faith. This king of Abuja became a master in the philosophy of modern religion. The dissidents from the North have their own ideas about it. The people are suffering and there is confusion everywhere. From everything the people hear and see they also fail to realise that their freedom and way back to prosperity will lie in their power to discern. They must know the truth so that they can be free. Else there is a risk they will become slaves to anything that they do not understand. Muyiwa was one of those who believed that life started and will end on earth. He had a premonition but he didn’t know it. He was a kind fellow and he lived in peace with everybody though his heart was always troubled in his private moments. Hope is quenched when we die. Maybe tomorrow will be better, Mama Esan thought out loudly pondering what she was going to do next as she stood on her feet. She is awake now. Still a voice echoed in her head: what if it is true that tomorrow never comes. Then she sat down again, and wept.